Consider this hypothetical example of a last-dollar scholarship. 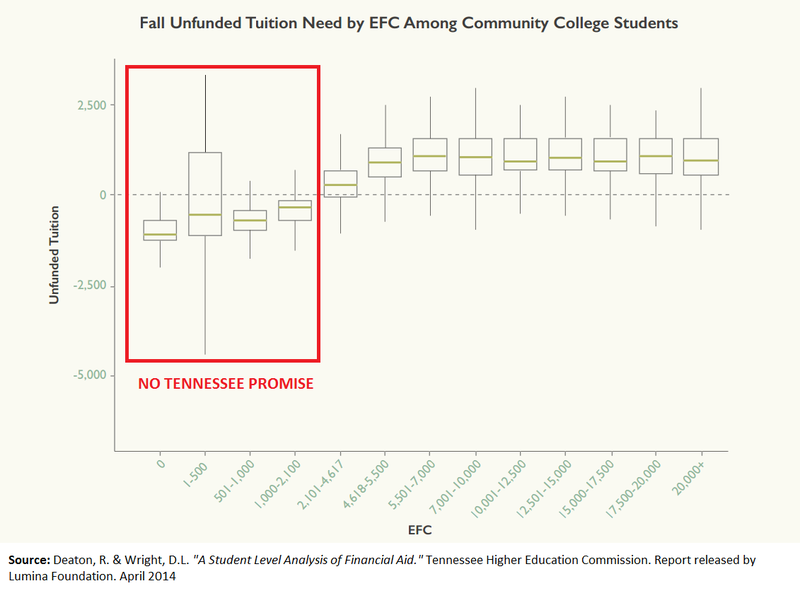 A student with a zero expected family contribution (EFC) qualifies for a maximum Pell Grant ($5,730 for the 2014-15 academic year) and a Supplemental Educational Opportunity Grant of $1,500. If she enrolls at a public university with tuition and fees of $9,000 per year, the last-dollar scholarship would then cover the remaining $1,270. But if she goes to a community college with tuition and fees of $5,000 per year, the last-dollar scholarship does not pay a dime. This doesn’t mean that last-dollar scholarships don’t have value. They do benefit community college students who barely miss qualifying for the federal Pell Grant, as well as students attending four-year institutions (such as under Indiana’s 21st Century Scholarship program). Another important benefit of last-dollar scholarship programs is informational. Students may be induced to attend college simply by having better knowledge of what college costs, even if they do not receive any additional money. The literature on college promise programs, as I summarized in this paper, suggests that informational campaigns can increase college enrollment rates by several percentage points. Last-dollar scholarships are politically attractive due to their clear message about college costs (even if they’re excluding any housing or living expenses) and relatively low cost. If the goal is to help the neediest students afford college, however, states may want to consider adding stipends to students whose tuition is already covered by funds from other sources. Pingback: Tony's Thoughts » Will the Tennessee Promise of Free Community College Work? Previous Previous post: Should There Be Gainful Employment for College Athletes? Next Next post: It’s National College Decision Day. So What?